When the little Buffalo Linkstation 420 showed up at my doorstep, the first thing I noticed was it is compact and very lightweight. I received the 2 TB version, but the 420 also comes in 4, 6 and 8 GB diskful configurations. 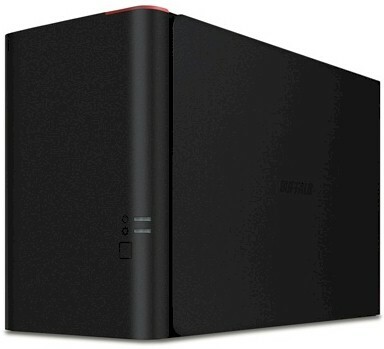 While I didn't objectively measure it, its overall size and weight seem to be even less than my 1-bay Synology DS111. As I do with each review, I pulled out the Quick Setup Guide and then went to the manufacturer website. On the Linkstation 420's product page, there are claims that it is, "High Performance - 3X Faster than a Standard NAS Device". No asterisk was provided for clarification of what qualified as a standard NAS. And we are left to guess if performance means CPU processing, file access times or what. For a NAS, however, one would think performance means file copy performance. So as I review the Linkstation 420, we'll see how it compares to what might be considered "standard" NASes. The Linkstation 420 is a no-frills device. Both drives are accessed via a plastic removeable front door which simply snaps on. Drives cannot be locked and each slot is appropriately labeled. As you can see below, there aren't a lot of ports, lights or switches for the Linkstation 420. You get one Gigabit Ethernet for LAN and one USB 2.0 for attaching a backup drive or sharing a printer. A quick peek after I removed the Buffalo cover showed me the 1.2 GHz Marvell Armada 370 SoC without heatsink. Table 2 summarizes the key components. The NAS came loaded with two Toshiba 1TB drives (DT01ACA100). Power consumption measured 14 W with the two drives spun up. There is no idle drive spin-down. Fan and drive noise were classified as very low, essentially inaudible in my quiet home office. Firmware for this review was 1.01-0.53. The admin interface is very much like that of the TeraStation, except that the Linkstation 420 defaults to the Easy Admin screen (screenshot below) where you can see options without being logged in. Clicking on any option on the Easy Admin screen pops up a login. The LinkStation GUI also uses more muted colors than the TeraStation.